But I don’t give up. I eat produce in front of her. I offer a variety of vegetables, served a variety of ways. And, until I know she’s eating what I want her to eat, I find sneaky ways to get by her. This is my number one trick. We drink smoothies every day. My girls even help me make them. My same girls who shun any vegetable offered at the table will watch me pile spinach, kale, sweet potato chunks, and shredded carrots into the blender before adding their own favorite fruits, milk, and unsweetened yogurt. They don’t even object if the resulting smoothies are green. My five-year-old cheers when she sees zucchini come into the house because she knows that means it’s time to make zucchini muffins. 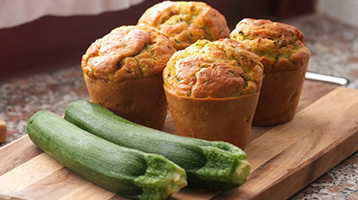 When zucchini isn’t in season, we do carrot raisin or pumpkin muffins. I’ve even seen recipes with puréed winter squash. Vegetables at breakfast? Win! My Mac and cheese now always features puréed squash. I used to add finely chopped steamed broccoli too until my kids started picking it out. Then I switched to cauliflower which blends in better. My sloppy joes, and sometimes my pasta sauce, have shredded carrots and mushrooms. My meatloaf has spinach in it. Whenever I can, I throw in finely chopped bell peppers. The funny thing is my kids know now that I do this. They watch me. They help me cook. My older one even explains that it’s a good way to get her veggies without having to taste them. So, maybe I’m not as sneaky as I thought, but that just makes it even better.